Hotel "Slava" is located in the very center of Zaporozhye at the intersection of cultural, business and entertainment life of the city. Near the hotel there are the Zaporozhye City Council, the park-alley "Glory", the clock "Lovers", a concert hall, cinemas and shopping centers. 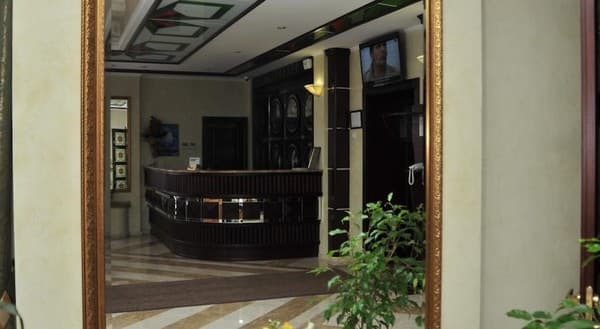 The hotel consists of 54 comfortable rooms, made in classical style and equipped with comfortable furniture, TV, safe, refrigerator, free Wi-Fi access. 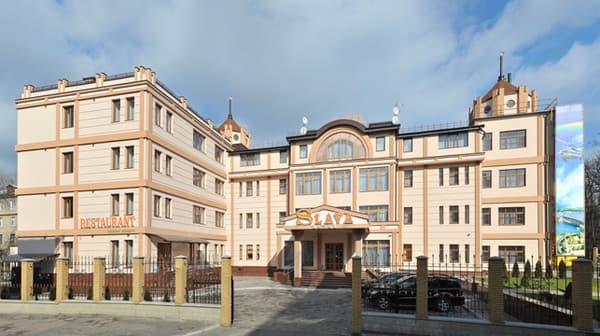 The hotel "Slava" has a spa, hairdresser, laundry, souvenir shop (in the lobby of the hotel), as well as a conference hall for 70 seats, equipped with modern equipment for presentations and seminars. Also at the service of the residents is a restaurant, represented by European and national cuisine, a lobby bar with a wide selection of alcoholic and non-alcoholic beverages. 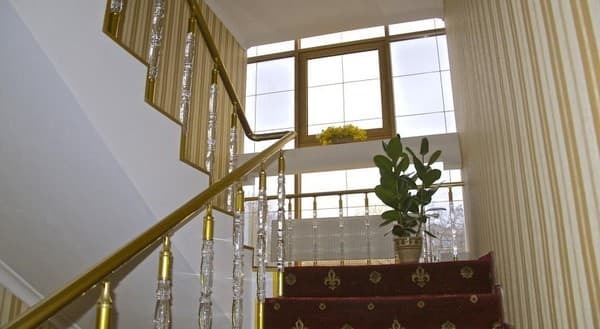 Hotel "Slava" is an excellent place for family holidays, as well as for business trips and meetings. The hotel is 8 km from the railway station, 7 km from the bus station and 16 km from the airport. 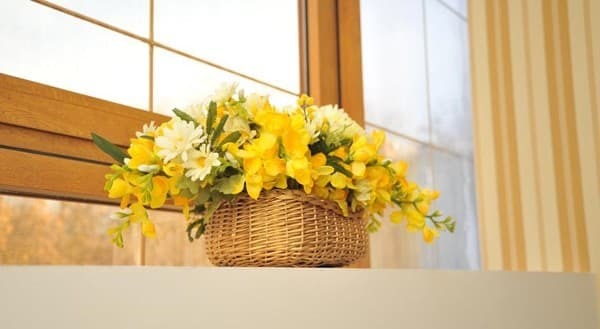 Description of the room: Room "Standard" - one-room cozy room with a total area of ​​up to 25 sq.m. , consists of a bedroom with one double bed and a bathroom with shower. At a single accommodation the price is less. 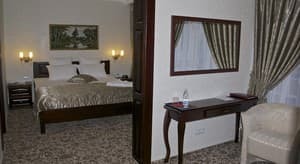 Description of the room: Room "Standard Superior" - one-room cozy room with a total area of ​​up to 29 sq.m. , consists of a bedroom with one double bed and a bathroom with shower. The cost of living for one person is 996 UAH. 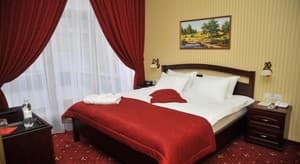 Description of the room: Room "Junior" - a spacious, one-room, cozy, two-zone room with a total area of ​​up to 32 sq.m., consists of a bedroom with one double bed and a bathroom with shower, as well as a recreation area. The cost of living for one person is 1296 UAH. 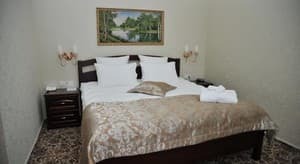 Description of the room: Room "Suite two-room" - spacious, cozy, bright, two-room suite with a total area of ​​45 sq.m., consists of a bedroom with one double bed and a bathroom with shower, and a living room with a sofa and work area. The cost of living for one person is 2293 UAH. Description of the room: Room category "Apartments" is spacious, cozy, bright, three-room suite with a total area of ​​50 sq.m., it consists of three rooms: in the living room there is a folding sofa and working area, in the bedroom there is a double bed, the third room is also a working area. The room is equipped with two bathrooms. The main bathroom has an increased area and is equipped with a shower cabin. The second bathroom is a guest bathroom, conveniently located at the entrance to the room. The cost of living for one person is 3692 UAH. Children under 5 years without extra beds are accommodated free of charge. The cost of additional space is 255 UAH. 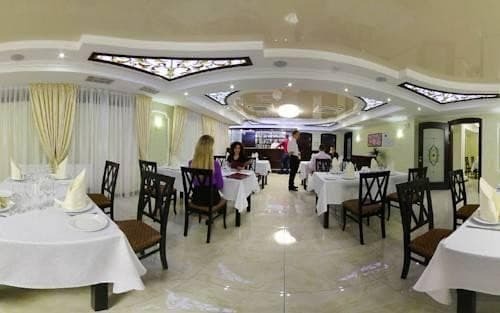 The hotel has a restaurant serving Ukrainian and European cuisine, as well as a lobby bar (open 24 hours). The hotel is located in the city center. The distance to the railway station is 8 km, the bus station is 7 km, the airport is 16 km, the embankment of the Dnieper River and the central city beach are 2 km away. To the railway station and bus station you can get by bus №3, №46, №61.